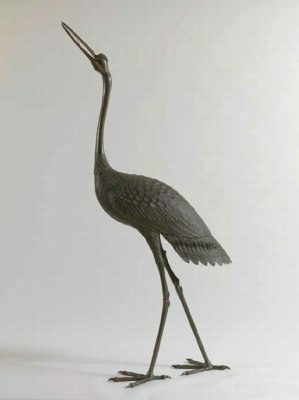 Mesdag’s extraordinary collection of Japanese decorative art: from samurai swords and Satsuma vases to colourful earthenware and bronze cranes. Exhibition at The Mesdag Collection from 7 March to 17 June 2018. Collecting Japanese arts and crafts was all the rage in Western Europe in the second half of the 19th century, and seascape artist and art collector Hendrik Willem Mesdag was an avid follower of the fashion. In the years around the opening of his museum in 1887, Mesdag acquired more than 140 Japanese objects, varying from colourful earthenware to samurai swords. Mesdag & Japan: Collecting the Far East places a large number of highlights from this collection in the context of the time: complemented by historical documents and several unique loans, the exhibition explores the entire period of The Hague’s fascination with Japan. From the period prior to 1854, when the Netherlands was still the only country allowed to trade with Japan, to the subsequent decade when the island empire opened its borders, resulting in a genuine craze for everything Japanese in Europe. This is the first exhibition to focus on Mesdag’s extraordinary collection of Japanese decorative art. One of the highlights from the collection is a rare large dish made from Arita porcelain, depicting a Japanese porcelain factory. The various scenes on this dish are painted like a strip cartoon. This is also the first time that a Satsuma earthenware vase from Mesdag’s collection is being united with the print that inspired the scene depicted on the vase. Mesdag & Japan: Collecting the Far East is on display at The Mesdag Collection in The Hague from 7 March to 17 June 2018. Mesdag & Japan features a total of 60 works, 48 of which are from the museum’s collection. The Japanese objects are placed in the context of Mesdag’s time by exhibiting them alongside historical documents and photographs that reveal how the objects were displayed in the artist and collector’s studio and residence. The three chapters of the exhibition explore the Japanese craze in Mesdag’s social circles, starting with the early interest in Japan in The Hague. The exhibition subsequently focuses on the unprecedented popularity of Japanese art with Mesdag and his contemporaries, before illuminating the influence of Japanese art on late 19th-century ceramics from The Hague, which Mesdag also collected. Japan rarely opened its borders, and therefore remained a mystery to the West for centuries. From 1639 to 1854, the Netherlands was the only Western country that was permitted to trade with Japan, and therefore enjoyed a unique relationship with the country. This meant that the Dutch were already somewhat acquainted with Japanese artworks. As early as 1816, Japanese art was exhibited in The Hague, at the Royal Cabinet of Curiosities (now the Mauritshuis). Mesdag & Japan includes a porcelain carp and an incense burner (on loan from the Rijksmuseum Amsterdam) that were once displayed there. The halls of the popular Grand Royal Bazaar (on the Zeestraat opposite Mesdag’s Panorama, within walking distance of his residence and museum) were also filled with exotic and Japanese objects. Mesdag bought many of his Japanese objects from the E. J. van Wisselingh & Co. gallery in The Hague. He exhibited the pieces in his museum, residence and studio. 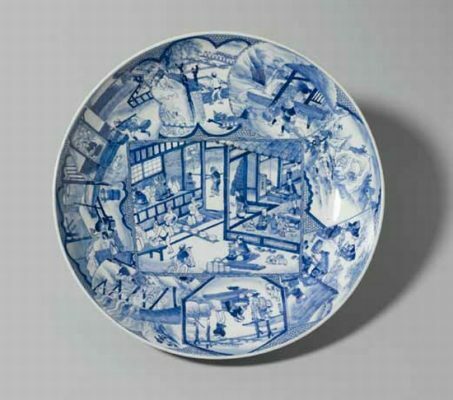 Highlights from his collection that are featured in Mesdag & Japan include a samurai sword from one of Japan’s best forges, two life-sized bronze cranes and a rare large dish made from Arita porcelain, depicting scenes of the production steps in a porcelain factory in the fashion of a strip comic. This ‘Night Watch of The Mesdag Collection’ will hold a prominent place in the exhibition. 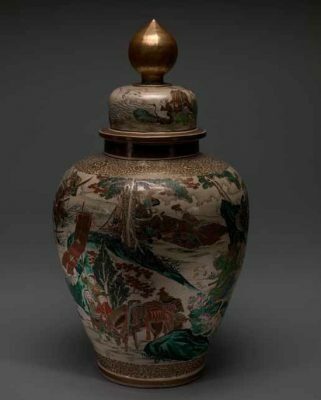 Mesdag & Japan also includes a multicoloured Satsuma ware vase depicting scenes from the life of the warrior Endo Morito. The potter meticulously copied this portrayal from a woodcut taken from an album by Katsushika Hokusai (Rijksmuseum Amsterdam). The vase and print have never before been exhibited together. Influence on artists in The Hague. The fascination for Japan also permeated through to decorative artists in The Hague. They became acquainted with the Japanese artworks at locations including Museum Mesdag. At The Hague-based pottery Plateelbakkerij Rozenburg, artists such as Theo Colenbrander produced ceramics that were clearly influenced by Japanese art, featuring typically Japanese objects, stylised motifs and the Japanese glazing technique. Mesdag held shares in Rozenburg, and was one of the first to collect work by Colenbrander. Colenbrander’s work and that of other artists based in The Hague is also featured in Mesdag & Japan. Running simultaneously with Mesdag & Japan: Collecting the Far East, the exhibition Van Gogh & Japan is on display at the Van Gogh Museum from 23 March 2018. Both exhibitions illustrate the influence of Japan and the popularity of Japonisme in 19th-century art. The Van Gogh Museum Foundation took over the management of The Mesdag Collection in 1990.